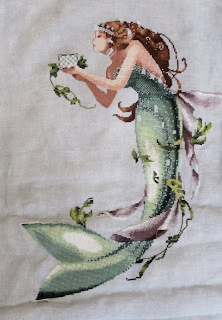 The particulars: The pattern is Queen Mermaid by Mirabilia. The fabric is 28 count (done over 2) Sterling Silver hand dyed linen from Silkweaver. 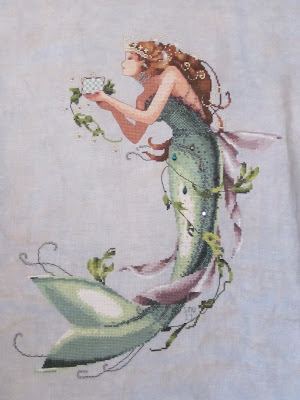 She was started September 2010 and completed May 22, 2011. She is my first finish of 2011. Ack! QM is my first project since deciding to switch over to using 28 count fabric instead of 32 count fabric. 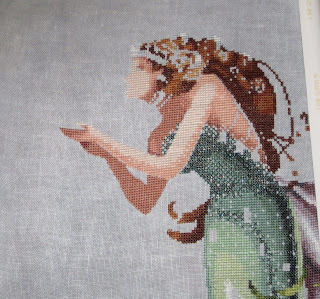 After struggling getting all the beads on Midsummer Night's Fairy with her 32 count fabric, I decided that I'd start kitting up projects with 28 count if there were a lot of beads. And QM definitely has a lot of beads, but honestly? They're so scattered across her that I don't think upsizing the fabric made much of a difference, except perhaps for her beaded collar and crown. But you'll be glad to know that the beads are sitting nicely in those areas thankyouverymuch. If I'd substituted Miyuki Delicas for the Mill Hills, I wouldn't have had anything to worry about at all as far as getting beads to fit neatly on. Duly noted for future projects. The briolettes are a nice touch as far as the sparkle factor goes but are just kind of hanging on to her lower body. If I had to redo, I'd probably relocate them so that they looked like they were hanging off some of the seaweed instead of just hanging on to random body areas. Just sayin'. Also, the areas on the pattern that were left open for the briolettes and flower treasures were entirely too large (and oddly shaped to boot), so I did quite a bit of filling in there. 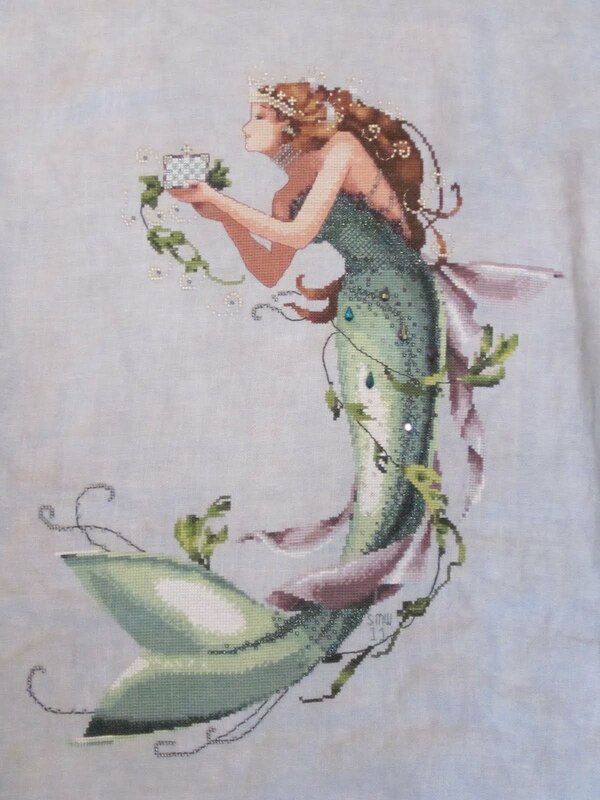 As I've mentioned before, I intend on doing Mirabilia's Deepest Love as a companion piece to Queen Mermaid. I have her kitted up and tucked away with another piece of Sterling Silver linen but I'm not sure that she'll be my next Mermaid start. Enchanted is calling quite loudly so we shall see. Eventually I'll have them framed to match so QM and Deepest can hang out together, probably in the powder room. Nekkid in that she's all finished with the cross stitch, but still needs her beads and just a bit more backstitching. Yay! Lots of beading to do, so it will probably take a few more days. The numbers in the slots are clipped off the Mill Hill packages, just so I know which ones to use where. It's a lazy way to keep track but highly effective. 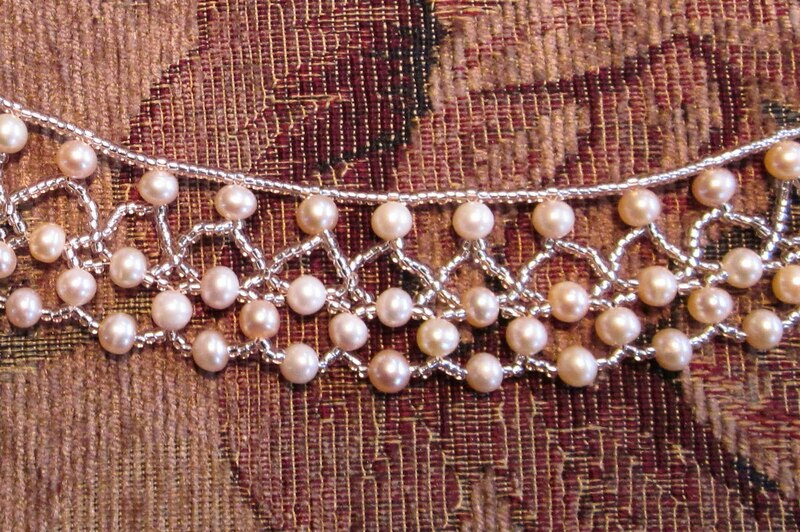 I'm looking forward to doing the beading...just a little more stitching and backstitching to do first. So. About Mill Hills. 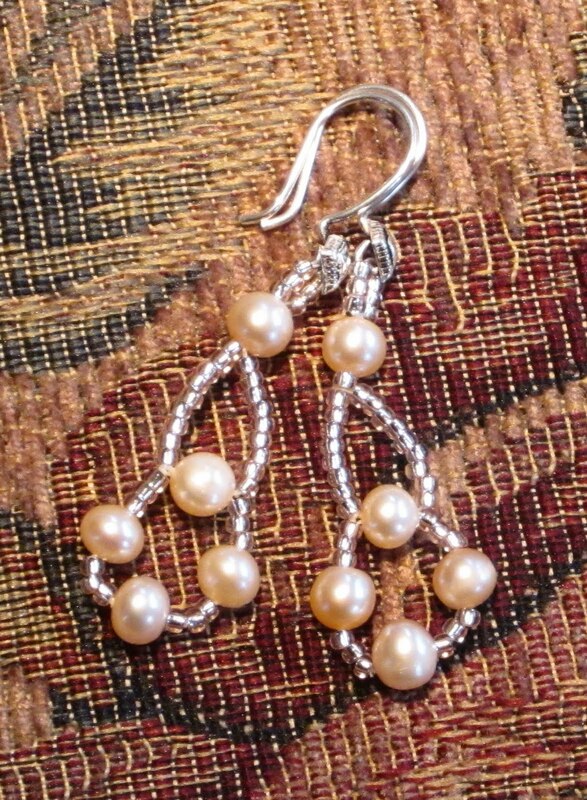 There's always leftover beads at the end of a project, and the question is what to do with them. In theory, I could bag them up, tag with their ID number, and hope I can use them for another project. If you've been following my blog, you've probably already figured out that is probably far too organized for me. I do have a small "bead soup" type jar that I usually toss the leftovers in. 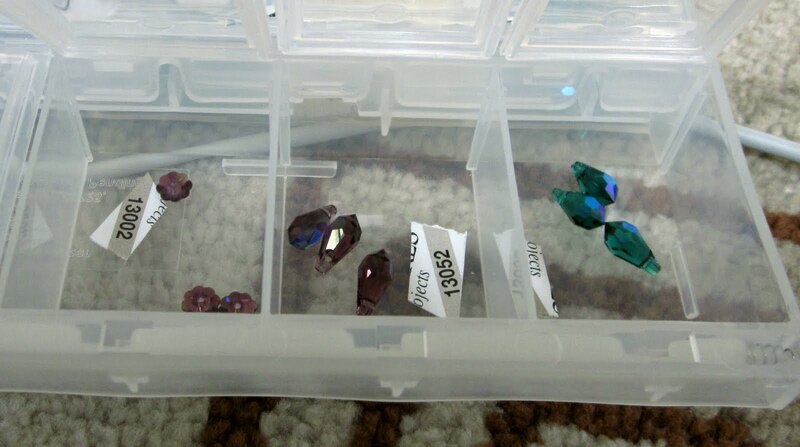 And now, there's the new bead stitching/jewelry obsession, and frankly, Mill Hills are not good for this type of use because as you've no doubt noticed if you've used them, they're not exactly the most even-sized beads out there. That's being diplomatic, right? Anyway, they're fine for stitching - there's usually plenty of them to pick through and you can discard the truly awful ones. Did some searching around and I've found that you can get the tubes of Miyuki Delicas for about the same price as the smaller packets of Mill Hills online...and the added bonus is that the Delicas come in more colors and are just about perfectly even so can be used for my other crafting activities. So I think, in the future, I'll be swapping out Mill Hills on stitching projects for Delicas so I can use the leftovers in jewelry projects. There's certainly no shortage of Delica colors so I can't see having a problem finding satisfactory matches. Obligatory face shot....she needs some beads! So even with a finish so close, I'm in a bit of a stitching mojo funk. I'm not really sure why, other than it hits the best of us from time to time. I'm still stitching; but just an hour here and there really. Ugh. Maybe I need a new start to kick me into high gear? 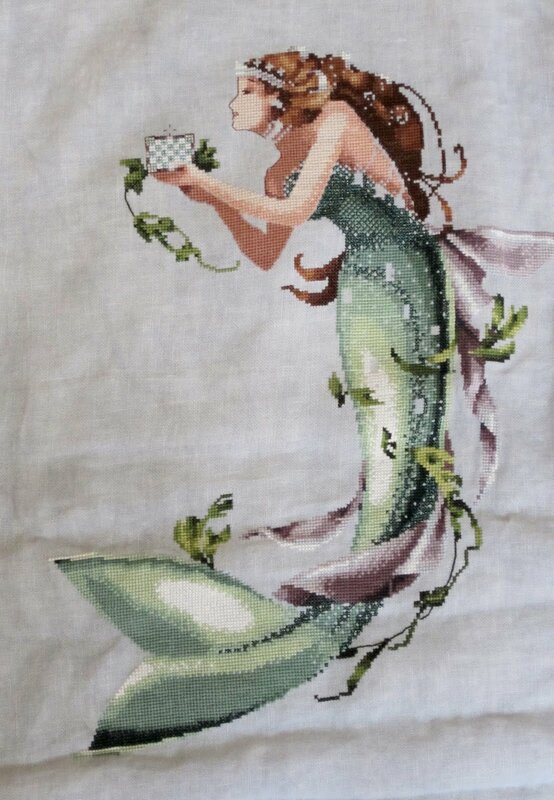 I am getting really close to being able to bead Queen Mermaid though. Here she is. Arms and head done....most of the hair (although I'm short one color - ack! )...her gift and some seaweed to do as yet. And the Queen Mermaid watch is on! 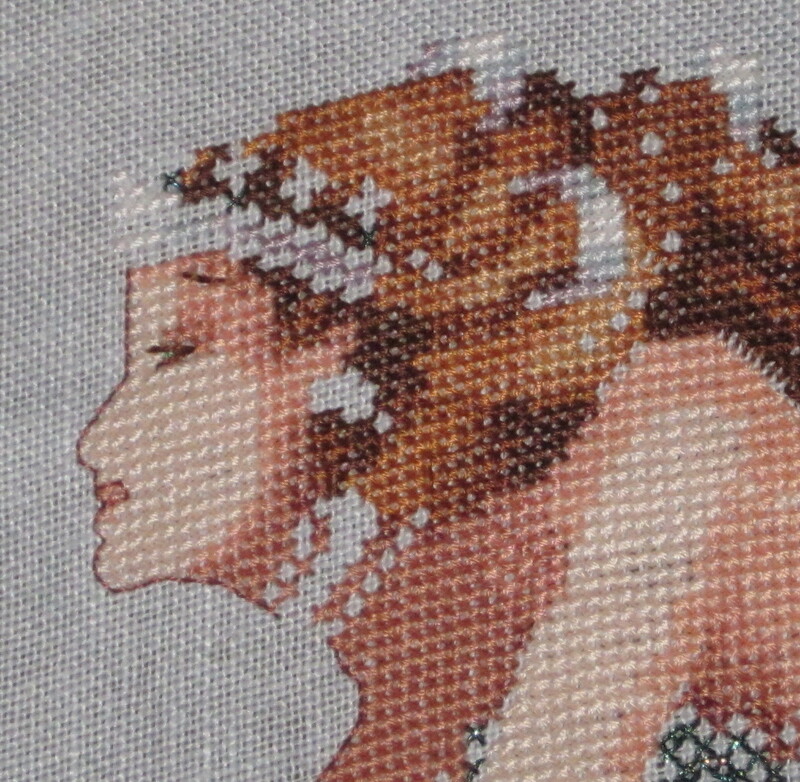 And of course, the requisite going back and filling in anything I missed, some backstitching, and beading. Lots of beading! But regardless, there's an end in sight, and it's high time I had a big finish this year, so QM is my focus until she's complete. Never fear, fellow Mermaid lovers, I have more Mermaids lined up. 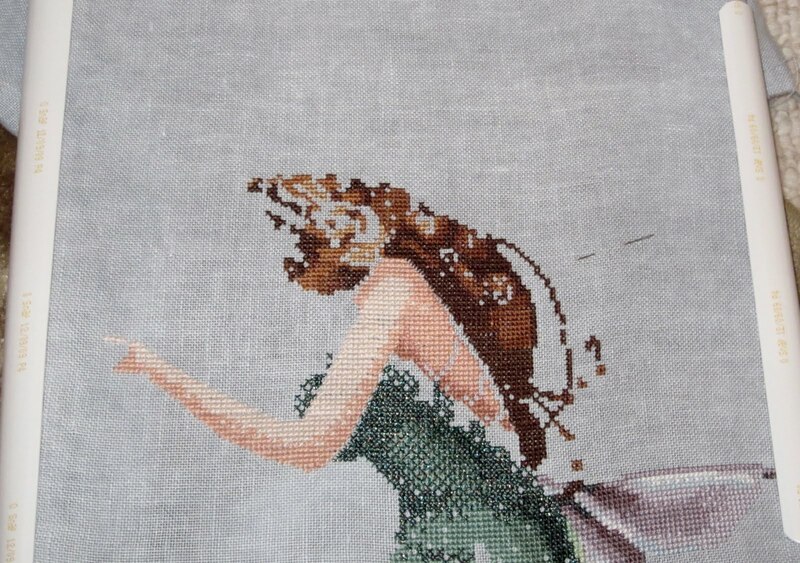 If you recall, my plans for QM include stitching her a companion, Deepest Love, on the same fabric. Long term, I'll get them framed to match so I have the option of having them "hang out" together. That said, yes, Deepest will be my next start, but I'll probably give a little love to some of the other Mira projects that I have going first, since I've been focusing on both QM and Knotgarden lately. Check back for regular QM updates - she'll be finished soon! 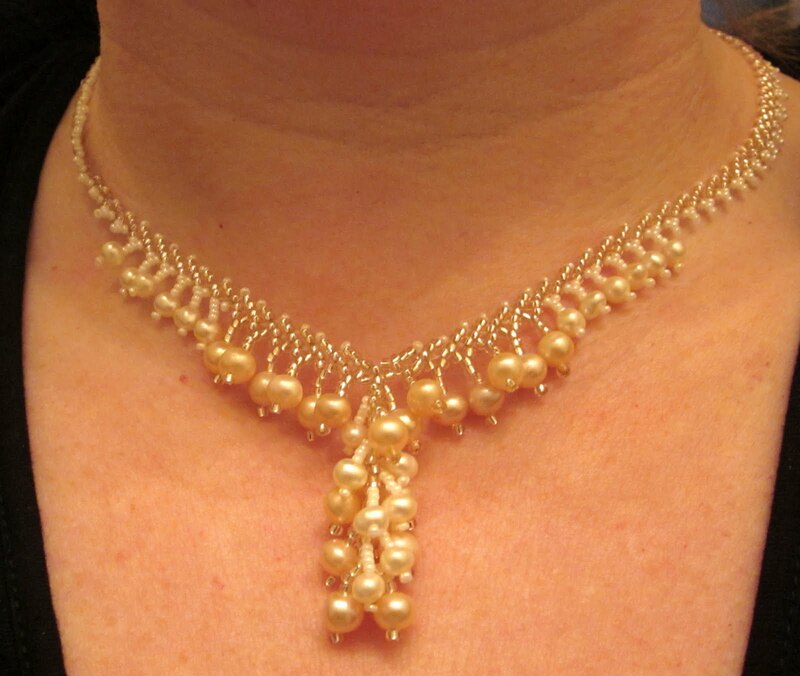 A couple weeks ago I went to a local Beadfest to wander around the vendors, and ended up feuling my pearl obsession a little more. 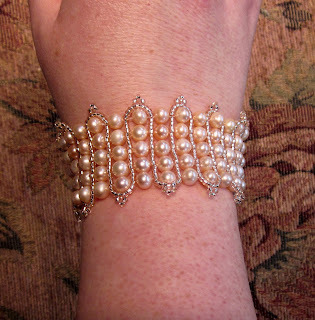 I picked up a couple of strings of lovely peach colored freshwater pearls with the idea that I wanted to do a wider cuff bracelet in right angle weave, similar to the amethyst bracelet I made previously. I wanted to do something monochromatic, so I added size 11 Miyuki seed beads to the mix to keep it simple. 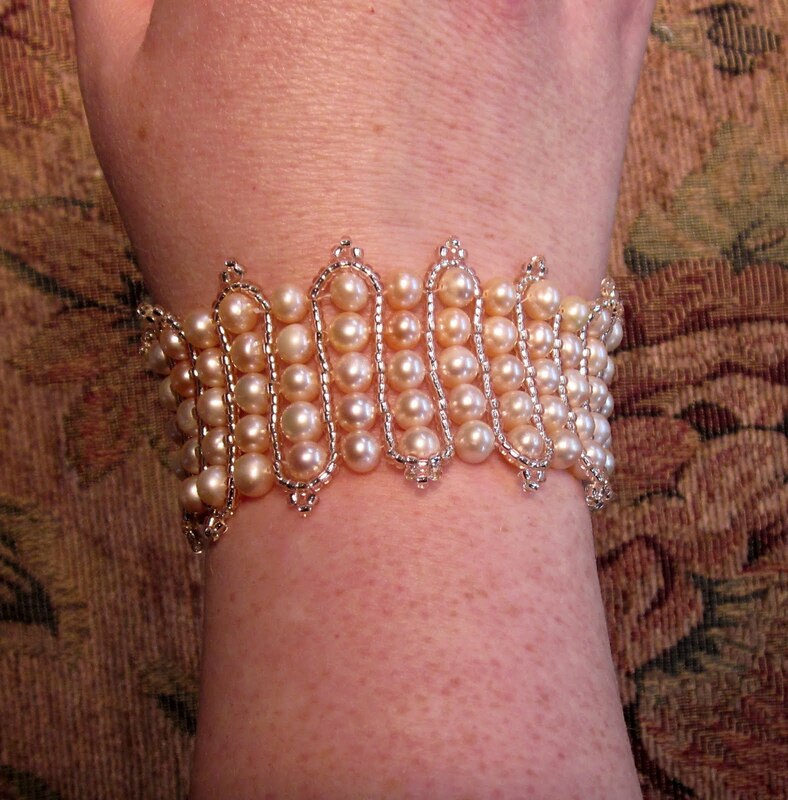 I spent much of Friday watching the royal wedding festivities and playing with beads - not a bad way to spend the day! 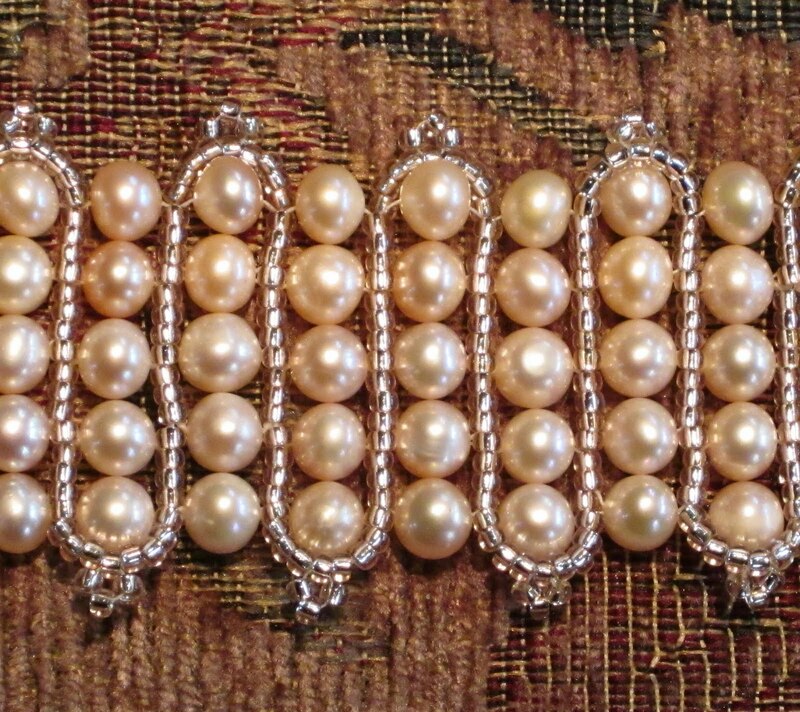 I used a slide style clasp so the cuff would sit flat when wearing it. I keep seeing 6 lb Fireline being the recommended thread to use, but I tried 8 lb for this project to see if that would give it a little more body, which it seems to do. The knots when ending threads aren't as tight though since the fiber is a little heavier, so I made sure I went through quite a few beads with it. 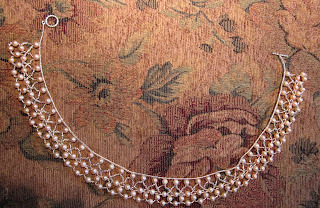 Right angle weave seems to be a very popular beadweaving stitch, and I can see why. It's not hard to master and is quite versatile. I'm sure I'll be experimenting with it again with other projects. 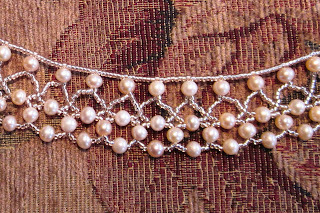 Because the pearls are slightly irregular, you can actually see some of the threads here and there in the bracelet, but I'm still very pleased overall with the effect. 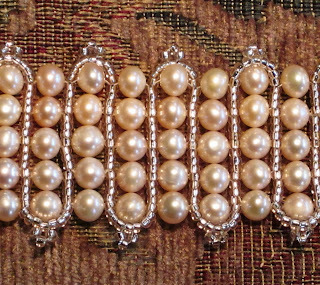 I have another pearl cuff bracelet that I wear all the time, so I think I'll end up with a lot of use out of this piece. 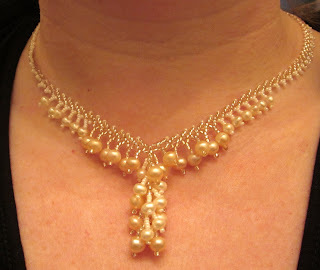 And of course, I wanted some sort of coordinating necklace. 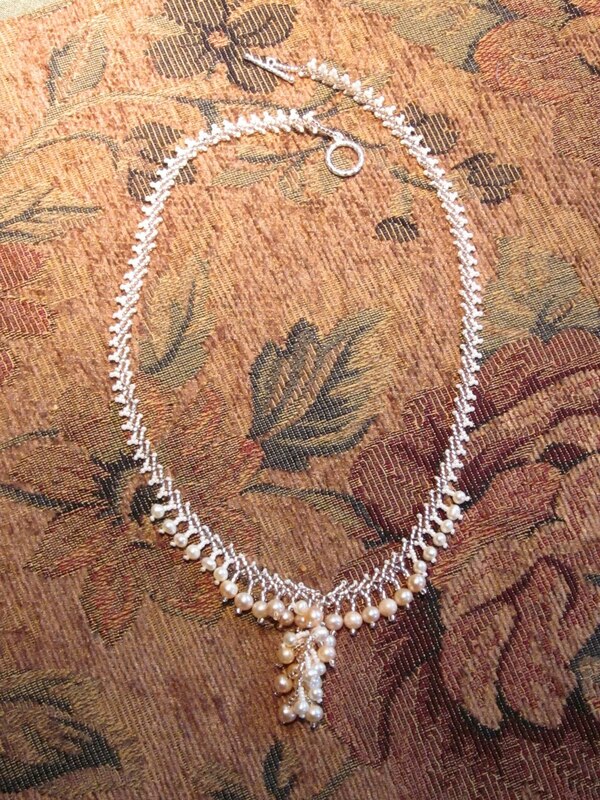 I chose to do a variation of the Gothic Chevron necklace from B&B's Your Seed Bead Style book. 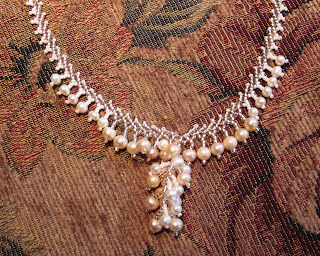 The pearls I was using were larger than the recommended size for the pattern, so I also opened up the bottom a little by adding a few seed beads in there as well. This was quite fun to make and easy once I got the pattern down. I did start it and undo about five times until I had the variation down pat that I was doing. It doesn't sit perfectly flat on my neck which bothers me a bit and I might redo it in the future as I get better with beadweaving skills. Since I did spend a bit of time reinforcing the necklace, it's going to be a project to take it apart though LOL To be fair though - our necks aren't one continuous curve so if you make a collar with an even curve, there ARE going to be areas where it's not perfectly smooth. Meh. They're ok. I'm not sure what bothers me about them. 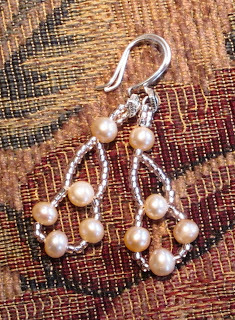 I had about two dozen leftover peach pearls which I suppose I could have just tossed in my stash along with another tube of the seed beads. 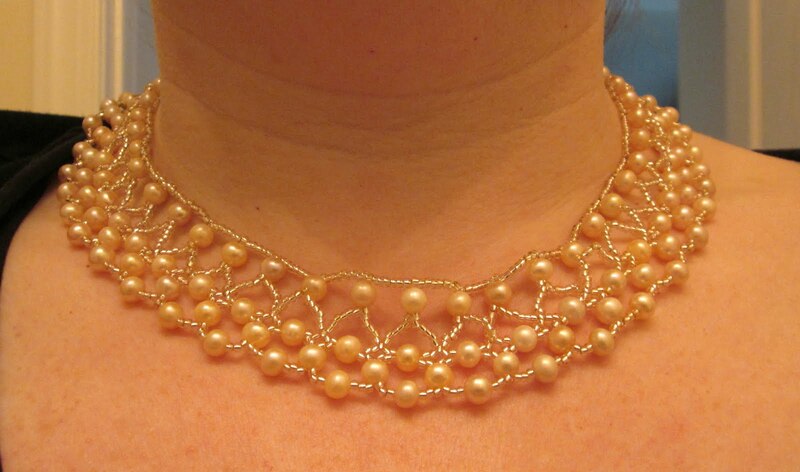 Although I like the collar, it's not a very "casual throw on" kind of necklace so I started paging through some of the various bead magazines I have, looking for inspiration for something a little lighter. I've really been drawn to St. Petersburg chain because I like the feathery lightness of it, and found a project that I borrowed some elements of. Since I didn't have many peach pearls left, I dug in and added some small white potato pearls in, and some rocalle (15/0) seed beads with a white pearl finish. I like how delicate the chain came out and it was a lot of fun to stitch.